Before Spring Point Ledge Light was built in 1897, sailors had complained for years about a dangerous promontory, responsible for the shipwrecks of dozens of vessels, that jutted into Casco Bay at the mouth of the Fore River. For more than a hundred years now, the cast iron lighthouse has guided ships to safety. Its flashing light is fully automated these days, but for many years it ran on kerosene, and had to be maintained by a keeper and his assistant, both of whom lived in the austere and isolated quarters in the base of the building. Since the house was originally surrounded on all sides by water, the keepers used to exercise by running laps around the deck—56 laps to the mile. 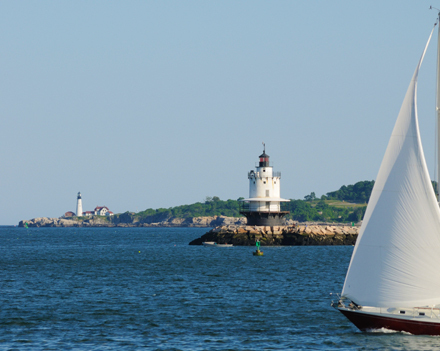 Spring Point Ledge Light is 54 feet tall and accessible by a breakwater built in the 1950s. Thomas Dwyer, the contractor who built it, also designed several important buildings in New York City, including a wing of the Metropolitan Museum. The lighthouse is a common 19th-century model, but it’s the only one of its kind that is open to the public. The breakwater that leads up to the lighthouse is open to the public year-round, and there is a small gift shop nearby. The lighthouse itself is open for tours most Saturdays during the summer. 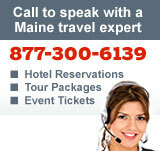 Call (207) 699-2676 to find out when open houses are held. For their own safety, children shorter than 55 inches (4’7″) are not allowed inside the lighthouse.